Do you want to keep the bird sounds out of your recording? 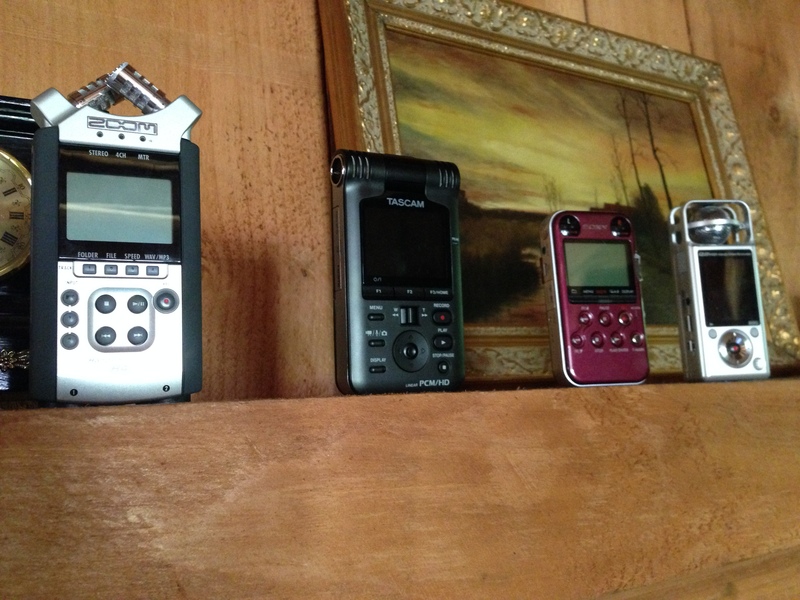 If you want to keep score, that’s a Zoom H4n, a Tascam PCM/HD, a Sony PCM/M10, and a Zoom Q2HD. They are arrayed on the mantle of the family house in Vermont, having just been used to record a new solo bass clarinet piece of mine. I tried to make the levels relatively similar, though doing this just using the visual meters wasn’t all that accurate. Even before activating any of the plugins that come with these handhelds, the results were distinct. All of them recorded well, though. The sound on the Q2HD was very hot, and it picked up a lot of noise that I would rather not have documented – it was also a bright sound. The Tascam levels were the lowest of the bunch, but the sound was warmer as well. Out of the available files, I chose to upload the one from the H4n, and added a small bit of reverb. The new piece takes off from some pieces by Scott Miller and Martin Gendelman that I’ve performed over the past year, both of which included multiphonic sounds. This is the first time I’ve really used them in my own work, and they are still not 100% reliable for me as a clarinetist – some work better than others. And many are so soft that traffic sounds from outside the house cover them up – hence the trial recordings in Vermont, far away from traffic, where you only have the birds to worry about. But I can live with the bird sounds for now.